Since its advent in the 1980s, Magnetic Resonance Imaging, or MRI, has been broadly used in medicine for the diagnosis of musculoskeletal conditions. Meanwhile, sonography, while emerging and evolving simultaneously, has taken a back seat to MRI in North America. The reasons for the use of MRI over Sonography have less to do with efficacy, and more to do with issues like training and economic concerns, according to a recent article by Dr. Levon N. Nazarian, published in the “American Journal of Roentgenology.” In the article, Dr. Nazarian makes a strong case for ultrasound imaging as a valid and in some cases superior diagnostic tool for musculoskeletal injuries. While he does not go so far as to suggest that MRI be abandoned in favor of sonography, Nazarian see ultrasound as an important complementary tool for providing state-of-the art imaging for patients. ● Ultrasound uses reflected sound waves to create an image, whereas MRI uses magnetic fields. ● Ultrasound equipment is relatively inexpensive and takes up little space, while MRI is very expensive and requires a large space to house equipment. ● MRI takes a still picture, while Ultrasound gives you a real-time moving image. ● MRI can “see” through bone and air, while ultrasound cannot. 1. Not all patients can safely undergo MRI: Patients with implanted devices like pacemakers and other metal orthopedic implants are not good candidates for MRI, nor are claustrophobic patients, or those who find it difficult or painful to lie supine during MRI. 2. Ultrasound images have higher resolution, revealing more minute detail than MRI, and can detect foreign bodies and calcifications not visible on MRI. 3. Sonography allows for dynamic imaging: Many injuries or musculoskeletal abnormalities only manifest during movement. For example, snapping hip syndrome is evident during hip movement. Dynamic imaging allows the therapist to observe the anomaly in action, something that cannot be done with a static image while the patient lies supine. 4. The ultrasound device can be targeted to a specific area of pain, increasing the chances of detecting the problem and reporting clinically relevant findings, whereas the MRI image is broad and general, increasing the likelihood of misdiagnosis or missed diagnosis. 5. Ultrasound is safe for patients with pacemakers and other implanted metal devices, and it can reveal impingement of soft tissue between orthopedic hardware. 6. Color Doppler sonography and power Doppler sonography offer high resolution imaging that can distinguish between veins and arteries, detect neuromas, identify foreign bodies and depict inflammation and infection, none of which can be seen with MRI. 7. Ultrasound can distinguish between solid material and fluid, reducing the risk of misdiagnosis of cysts or other collections of fluids. 8. Sonography is effective in guiding treatment interventions, targeting soft tissue masses during needle aspiration or core biopsies, and during treatments like injections of corticosteroids, sparing the patient misdirected needle jabs. 9. Sonography makes it easy to compare one side of the body to the other, giving the clinician a frame of reference during evaluation. 10. The ultrasound probe can be easily moved about the patient’s body, making it a superior choice for evaluating long structures in the body, such as peripheral nerves. We should also note that MRI imaging is typically conducted by a lab technician, and later viewed by a radiologist without the patient present. 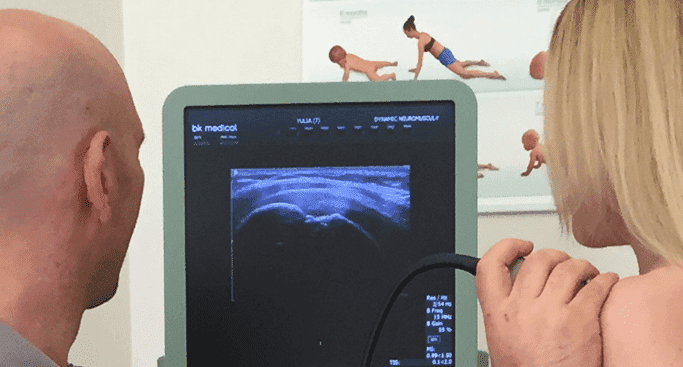 Ultrasound evaluation, on the other hand, is very interactive between patient and practitioner, placing the patient at the center of diagnosis, where they are able to provide verbal feedback about pain and discomfort associated with their area of injury.